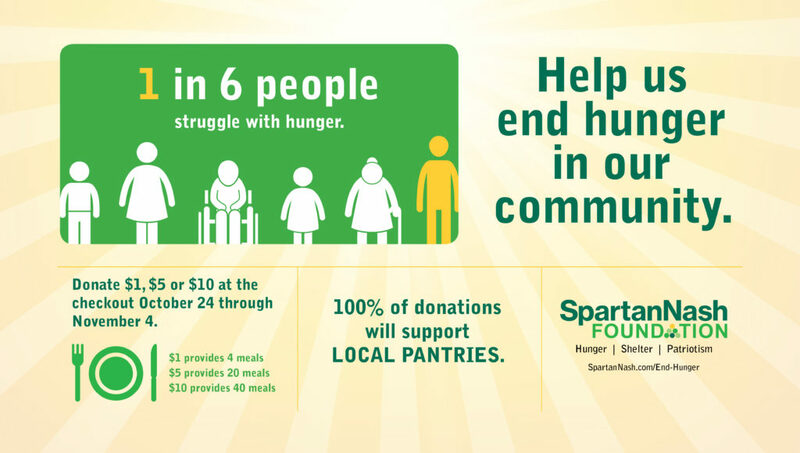 GRAND RAPIDS, Mich. – The SpartanNash Foundation is hosting a companywide fundraising effort to help end hunger in the communities it serves, inviting store guests to join the Foundation and SpartanNash associates in supporting more than 100 local food pantries and food banks. The retail scan campaign runs October 24 to November 4, and 100 percent of dollars raised will support community food pantries selected by each of SpartanNash’s corporate-owned stores in eight states. During the companywide fundraising campaign, customers who visit any SpartanNash-owned retail store or fuel center in eight states will have the opportunity to donate $1, $5 or $10 at any checkout lane. One hundred percent of dollars raised will go to the selected food pantry partners in each community, with additional support provided by the SpartanNash Foundation. SpartanNash underwrites the cost of the fundraising campaign, and associates and the SpartanNash Foundation – the company’s charitable giving arm – contribute financially as well. In 2017, $259,150 was granted to more than 100 local food pantry partners through the SpartanNash Foundation’s retail scan campaign to provide hunger relief. SpartanNash also donated 5.4 million pounds of product to community food pantries and local nonprofits throughout its company footprint, in addition to financial support through the SpartanNash Foundation. The hunger scan is the fourth scan campaign the SpartanNash Foundation will execute in 2018. To date, $773,200 has been raised through the generosity of store guests and funds contributed by SpartanNash and the SpartanNash Foundation, benefitting local Special Olympics, Habitat for Humanity and patriotic partners.